The Singapore Institute of Technology (SIT) has announced a new joint degree programme in Nursing with the University of Glasgow. The Bachelor of Science with Honours in Nursing is SIT’s first joint degree in partnership with the University of Glasgow. It is also one of the seven new degree programmes to be launched by SIT in 2016. The two-year BSc (Hons) Nursing programme is a full-time post-registration programme that builds on the foundation the students have established through their nursing diploma studies. The aim of the programme is to develop critical, analytical and innovative skills, as well as leadership, research and clinical competencies. Graduates will be able to translate new nursing knowledge into practice by making evidence-based clinical decisions. To ensure that the programme stays relevant to the industry, SIT has consulted local healthcare institutions as well as the Singapore Ministry of Health on the curriculum. The Nursing programme adopts different pedagogical approaches of teaching and learning such as team-based learning, flipped classroom, standardised patients and simulation-based education. The new degree programme will also feature the Integrated Work Study Programme (IWSP), a core component of all SIT degree programmes. Students will embark on the IWSP in the form of a six-week Clinical Practice Education, where they will integrate their knowledge and practice in the delivery of patient care in the hospitals and community. In addition, students are required to complete the Overseas Immersion Programme (OIP) where they will attend two weeks of taught seminars and two weeks of clinical observation in Glasgow, United Kingdom. Classes for the pioneer cohort, with a target intake of 50 students, will be conducted at SIT@NP Building in Ngee Ann Polytechnic. “The University of Glasgow has been an overseas university partner of SIT since 2011 in five Engineering & IT degree programmes – Aeronautical Engineering, Aerospace Systems, Mechanical Design Engineering, Mechatronics and Computing Science. 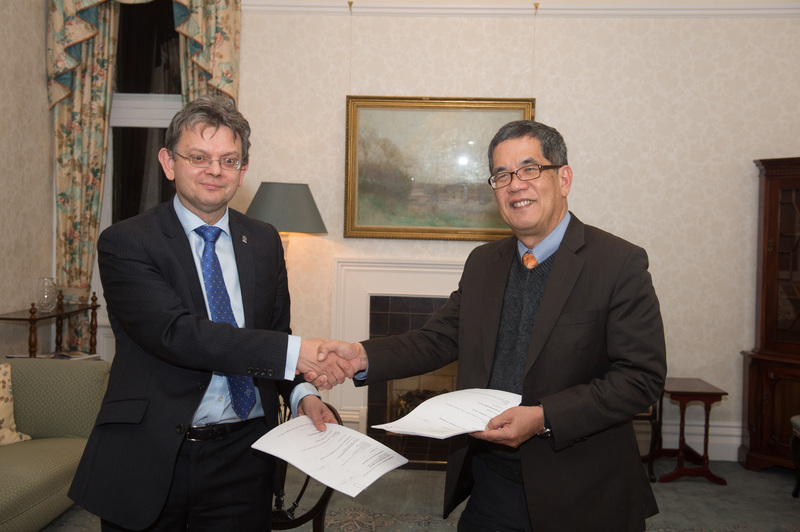 This new joint degree programme in Nursing will bring together the best of what our two institutions have to offer, as well as fulfil an important role in addressing the nursing care needs of the population in Singapore,” said Professor Anton Muscatelli, Principal and Vice-Chancellor of the University of Glasgow. Founded in 1451, the University of Glasgow is the fourth oldest university in the English-speaking world and is in the top 1% of universities in the world. UofG is a member of the distinguished Russell Group, comprising the United Kingdom’s 24 leading research-intensive universities, and is also a founding member of Universitas 21 – a network of universities established as an international reference point and resource for strategic thinking on issues of global significance. UofG students graduate with the skills they need to compete in a global workplace, and with friendships and networks that last a lifetime. Associated with seven Nobel Laureates, the University of Glasgow has inspired thinkers from eminent scientist Lord Kelvin and distinguished engineer James Watt to the father of economics, Adam Smith. The University of Glasgow sustains a broad portfolio of leading-edge research funded by industry, research councils and governmental agencies.